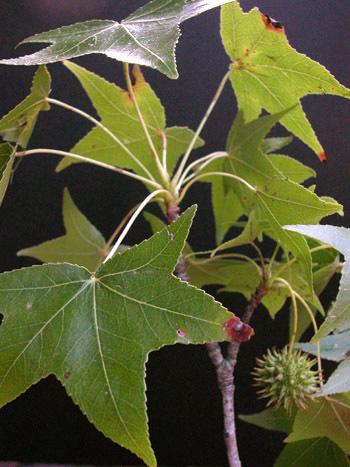 Sweet gum is a deciduous, forest-dwelling tree, growing as high as 150 feet, the tree is covered with rough, gray bark; but the branchlets are reddish-brown and often have corky ridges. When cut, it exudes a sticky, resinous gum or balsam. Its alternate, serrate, palmately lobed (star-shaped with 5-7 toothed lobes) leaves are dark green and shiny above and pale green underneath; in fall they turn a deep crimson. Leaves have an aromatic pine-like scent when crushed. The petalless flowers occur in globular heads, the male heads clustered in terminal racemes and the female growing individually on long peduncles. The fruit consists of woody capsules growing in round, spiny heads an inch or more across which stay on the tree through the winter. They are spiky brown hanging balls. Native to the eastern and southern areas of the United States. Found in mixed woods, in moist soils of streams and riverbanks; planted in cities in the east, in the Pacific states, British Columbia, Central America, Mexico. Native from southern Connecticut south to Florida and west to Texas. The “gum” is produced in pockets in the bark. Children sometimes chew the gum in lieu of commercial chewing gum. The balsam is used effectively externally for wounds and for skin problems. For external use it is usually made into an ointment with lard or oil. Native Americans used a decoction of leaves or roots as a wash to treat injuries. For coughs and respiratory congestion due to colds, the gum can be taken for expectoration or for sore throat. The bark has been used to relieve diarrhea and dysentery. Used to treat ringworm. Decoction: boil 1 tsp. bark or balsam in 1 cup water. Take 1 cup a day, a mouthful at a time. Tincture: a dose is from 1/4 to 1/2 tsp. Ingredient in “compound tincture of benzoin” available at pharmacies.